Welcome back, today we are looking at Lunar Extras which is the companion set to yesterday's Lunar Animals. For Lunar Extras, we focused more on the new year holiday and really tried to bring out its feel and essence. Cherry blossoms are a great representation of the new year, as they symbolize the promise of spring and new beginnings. 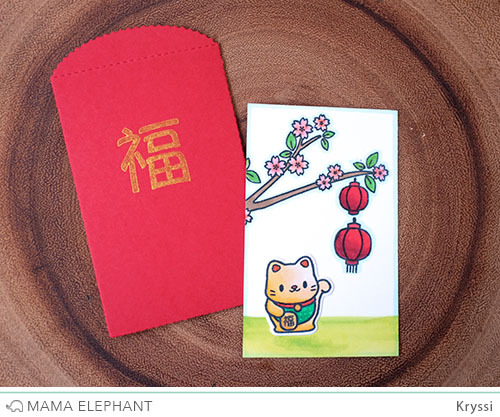 Here is my project, I created a lucky red envelope (hongbao)! 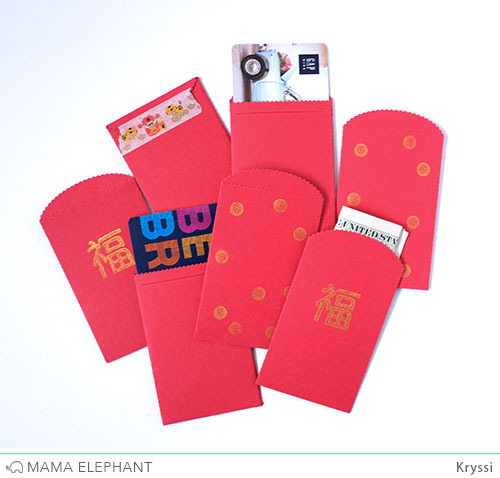 Traditionally, on Chinese New Year, adults give out red envelopes which contain money to kids. It means to send good wishes and good luck. We also give them out at weddings and even birthdays! The color red itself is a symbol of good luck in Asia. Every year, I would scramble looking to purchase red envelopes. I don't readily have them in my house. We created the Lucky Envelope Creative Cuts die so I don't have to scramble anymore, and neither will you. 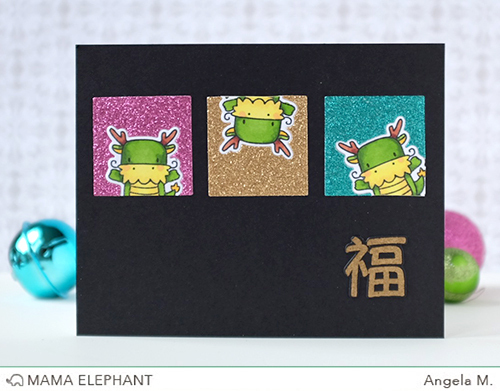 :) The Lucky Envelope die will also perfectly fit a gift card! Angela sure loves the Chinese characters in the Lunar Extra set! She paired the word "fook" which means good fortune in Chinese, with some fierce dragons. Who is she kidding? They are adorable lucky dragons! what does the Korean mean? Too cute! Love this lucky set! I am curious for all the meanings, though. Would look sophisticated if you knew how to use it, but dumb when you use it the wrong way, hihi. Can you translate? Love the lucky cat!! We do provide an English translation directly on the stamp label sheet. 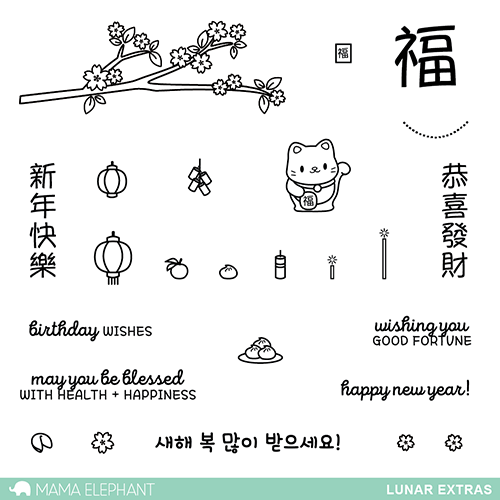 They are all popular sayings used to wish happy new year! Hi Wendy - The saying on the left is 'Happy New Year' and the one on the right is 'Wishing you Prosperity'. The single character (two sizes) mean 'Luck' - this character can be used upside down as it means 'Luck has arrived'. I'm not Korean, so I don't know what the Korean means! Thank you, Kryssi and Cecilia! Then I know what I'm sending to my Asian friends, hihi. Love this set! Very original! Cute! Love the baby dragon. Too cute - I'm definitely getting this.... Another idea... a Chinese wedding set with the 'Double Happiness' with love hearts would be great too! Oh, This is so adorable!! I LOVE those little envelopes and the fun images!! ADORABLE! I need all of these! Thank you for continuing to bring fantastic product to the market! I love them all. That's so awesome. I'm half korean and I never see stamps in that language. This set would be so great! I love all of these stamps. They are way to cute. I like the cards that were made. Finally, a Chinese/lunar stamp! This is definitely on my wishlist! Hopefully Mama Elephant will keep on producing more Chinese/lunar stamps like Mid-Autumn Festival, Dragon Boat Festival and etc! Oh these are looking great! Spot on perfect for making custom red envelopes! I love this! I'd also love to know what all the characters mean, though. Please enlighten us. I just scrolled up and saw that some folks explained the meanings are on the sheet! Thanks! Love this set and the envie is fabulous! Just adorable. Can be used year round. Great projects, and I really like that the topper has a handle--nice! I love all designs , I wish I can have them all to do all those great cards you guys magically create.